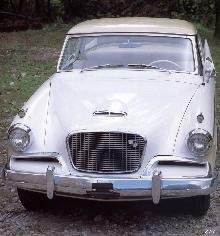 Studebaker disappeared for good in March 1966. At that point in time, it was the oldest car factory in the world, but that fact was of more interest to historians than it was to the shareholders. In 1852, the brothers Henry and Clem Studebaker left California. They had made their money building covered wagons from the many gold diggers. They then settled in South Bend, where they started a coach factory. In 1902, they built their first electric car. 1,841 of these cars were sold. It took until 1912 for the first Studebaker with a petrol engine to be built. In 1913, the range consisted of three different models, two with a four-cylinder and one with a six-cylinder engine. In 1920, Studebaker stopped building carriages. The company started focusing entirely on cars. This activity proved to be very lucrative and in 1922 the company already had a turnover of $100 million. 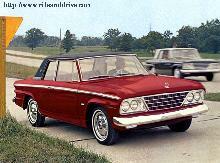 Back then, the company primarily built large cars. The last small model with a four-cylinder engine was finished in 1919, from then on the company only manufactured six-cylinder engines. In 1926, Studebaker presented the Erskine, a cheap model with a six-cylinder engine specifically intended for export. In the meantime, Studebaker had grown into a large company: in 1925 the company manufactured over 100, 000 cars for the first time. In 1928, there were approximately 21,000 on the payroll and the make was in fifth place on the list of American car manufacturers. Business was good, but the new director Albert Erskine made a few crucial mistakes. He had taken over as President in 1919 and saw Studebaker into the 1930's, but those mistakes cost Studebaker and indeed Erskine himself very dearly. The short lived car that he had named after himself was followed by his purchase of Pierce-Arrow in 1928 during the deep Depression. He put the smallest 6-cylinder engine into the Rockne, a minor make that only lasted from 1932-1933 and he named one of the series 'Dictator' at a time when Mussolini and Hitler were in power. Amazingly, the name was retained until 1937. 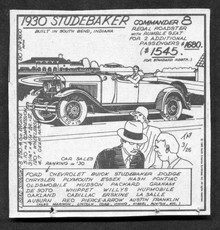 When Studebaker moved into the 1930's, the range consisted of the Dictator and Commander, the Studebaker six and the President eight, with a choice of six engines. In 1931 they cut their offerings to the Dictator, Commander and President series. Erskine still paid dividends in 1931, but they came from the company's capital reserves and he also made a failed attempt at a merger with White Motors. 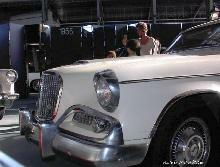 Sales were dropping and when Studebaker went into receivership in 1933, Erskine resigned. He commited suicide shortly after. 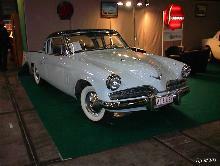 Studebaker was saved by Harold S. Vance, the production vice-president and Paul G. Hoffman, the sales vice-president who were to guide the company until 1949. They got rid of Pierce-Arrow, got the idle assembly lines up and running again and showed a small profit in 1934, enabling them to secure more credit. In 1938, Raymond Loewy, head of Loewy Associates, an outside firm, restyled the Studebakers with flush mounted headlamps. Frontal styling for 1939 resembled the Lincoln Zephyr, having a sharply pointed nose and two neat grilles low down on either side. 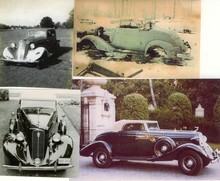 The new 'Champion' series was introduced that same year which considerably increased sales and by 1940, the Champion was available as three and five passenger coupes and two or four door sedans. For 1941, the entire range was re-worked and the Champion's and Commander's were offered in three styles of trim. The top of the range Skyway President Land Cruiser was introduced. WWII temporarily put an end to car production in 1942, when Studebaker turned their attention to trucks, aeroplane engines and Weasel personnel carriers. 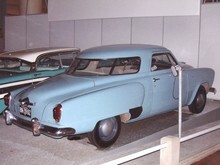 At the end of the war, most companies had to start again with new cars for public use, but Studebaker used the expertise of Loewy Associates and were able to introduce an all new design in Spring 1946, which included the unique 'coming or going' huge wraparound rear window of the two door 'Starlight' coupe designs. 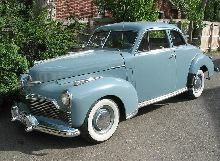 Until the new cars were ready, a small quantity of face-lifted 1942 'Skyway Champions' in three or five passenger coupes and two and four door sedans were offered. 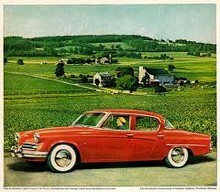 The 1947 Studebaker designs from the Loewy studio were slightly modified by Virgil Exner. Commander and Champion names were re-introduced that year, but without the 'Skyway' prefix and a new Regal Deluxe convertible was offered. The Commander Land Cruiser was Studebaker's luxury sedan. 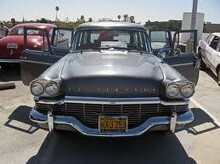 that sales figures dropped, the grille was retained for the 1951 models. 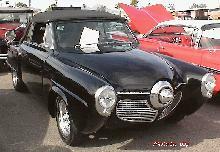 But the styling was so far ahead of the competition that it wasn't changed between 1947 and 1952 - Studebaker's Centenary Year - whan the whole Studebaker range was re-designed and the spinner was replaced by a 'toothy' grille referred to as the 'Clam Digger'. A new 'Starliner' hardtop was introduced, but sales still fell. In 1953, Robert Bourke from the Loewy team designed a brand new, very low, coupe purely as a Show model. It was hailed as the 'New European Look'. After revising a few of it's features, Raymond Loewy presented it to Studebaker and the car went into production as two and four door sedans and two types of coupe. Unfortunately, changeover to the new model caused delays and even more critically, the demand for the coupe was four times higher than the sedans, when management had planned for the reverse situation. A price comparison with comparable Chevrolet models to discover why sales were so bad revealed that the higher paid workers at Studebaker were producing less than other companies. Also, higher overheads and the isolated location of the South Bend plant from component suppliers, plus the highly productive Big Three's price wars were crippling the lesser companies. 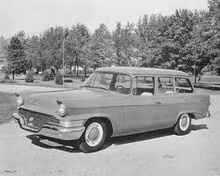 In 1954, James Nance, the president of Packard bought Studebaker to become the Studebaker-Packard Corporation with the intention of their combined entry into the market becoming one of the 'Big Four'. What Nance apparently didn't know was that Studebaker were well below their 'break-even' point of 250,000 cars per year with sales only around the 116,000 mark, so the merger did absolutely nothing for Packard. Nance began to search for financing, but this eventually resulted in a take-over by Curtis-Wright. The firm restyled for 1956, using the old bodyshells which were squared off and more upright with mesh-type grilles and a cheap two door known as the 'Sedanet' was offered in the Commander and Champion series. 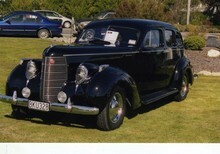 The long wheelbase chassis was now only used for the top of the range President Classic sedan and the four new sporty 'Hawk' series called 'Power' with a V8 engine, 'Flight' with a 6 cylinder engine, both based on the pillar type Starlight coupe, plus the 'Sky Hawk' and 'Golden Hawk' based on the old Starliner hardtop. The 1956 Golden Hawk was fitted with a large Packard engine which made it extremely front heavy, so for the 1958/1959 model it was replaced by a V8 engine and a Paxton supercharger that gave the same power output, but was more efficient. The other Hawks were replaced by the single pillar Silver Hawk with an unblown engine. Things got worse from 1956 to 1958 when the combined total of cars turned out between Studebaker and Packard was only 70,000 per year. Studebaker hit rock bottom in 1958 when less than 45,000 cars were sold. 1959 saw the introduction of the compact 'Lark' created by stylist Duncan McRea which used body panels and parts off models dating from 1953 to 1958. The Lark was offered as a two door sedan, a two door station wagon and a two door hardtop with a 6 cylinder or V8 engine and 48,459 were sold in 1959. 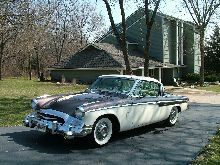 Only the Silver Hawk was offered at the same time and Studebaker were in a profit situation for the first time in six years. In 1960, the Big Three introduced their new compacts. 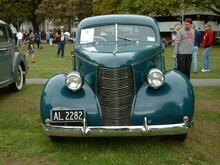 The Lark was given mild alterations to the grille and script. The Hawk was unchanged, excellent value and performed well, but the main advertising was for the Lark which hampered sales of the Hawk. two-tone treatment at the base of the body fins. Sherwood Egbert became company President in early 1961 and he asked stylist Brooks Stevens to help restyle both the Lark and the Hawk. 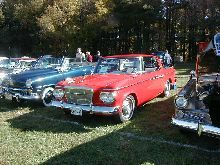 Studebaker were distributing Mercedes-Benz cars at the time and one of the features that appeared on the new design was a rectangular Mercedes look-alike grille. The sporty Lark Daytona hardtop and convertible made their debut. For the Hawk, Stevens re-skinned the old loewy coupe, eliminating the out-dated fins and called it the 'Gran Tourismo' Hawk and general sales picked up in 1962, although sales of the Lark started to drop. to the Lark and round amber parking lights. Inside, it had a wood-like dashboard and pleated vinyl seats. Without doubt, Studebakers saviour could have been the Avanti, introduced in 1963. The original Avanti was instigated by Sherwood Egbert in 1960. He realised that a face-lift to the current Studebaker range couldn't compete with the completely new compacts produced by the Big Three that year. Despite a slight increase in sales, he knew that this wouldn't last and decided to go for a new sports-type car. He again turned to Raymond Loewy who's contract had lapsed after completion of the 1956 Hawk series. crash protection padding, an aircraft style dashboard and four slim bucket seats. Corvette. Despite successes in stock car speed trials at Bonneville, fewer than 4600 Studebaker Avanti's were produced before the company closed the South Bend plant and moved to Hamilton, Canada in late 1963. The Avanti name, the production rights and a small part of the South Bend plant were sold to two ex-Studebaker dealers who called their new car the Avanti II. In Hamilton, Studebaker continued with new Brooks Stevens designs for 1964. The 'bread and butter' range was now comprised of the Challenger, Commander, Daytona, Cruiser and Wagonaire, without the Lark prefix, although there was a Super Lark, Super Hawk and Gran Tourismo Hawk with a partial vinyl top. 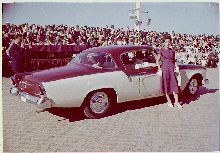 The 1965 cars were identical in appearance but Chevrolet engines were used now that the South Bend engine plant had gone. The last Studebaker, the 66, had a new front end with two dual beam headlamps instead of four separate lights and a revised grille. But despite desperate attempts to revive Studebaker, the Hamilton plant closed in March 1966. The Studebaker Corporation purchased the Wagner Electric Corporation in 1967 and combined with Worthington Corporation that same year to become Studebaker-Worthington Corporation. They were bought by McGraw Edison in 1979 who have retained the name, but there is no production line.